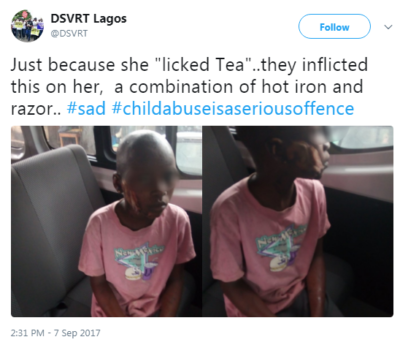 According to the Domestic and Sexual Violence Response Team (DSVRT), the little girl pictured below was brutalized by her guardian in Lagos with hot iron and razor blade for licking tea. Tell somebody that knows somebody that knows somebody who is still engaged in this terrible acts… IGNORANCE OF THE LAW IS NOT AN EXCUSE!!! Also a good time to remind you about the @dsvrt. They coordinate domestic and sexual violence responses in Lagos. Call 112 or 08137960048.